Marita Cheng has started two companies and a global non-profit organisation, is on boards and regularly gives talks. But she’s not taking her foot off the pedal yet. You have probably seen the TV advertisement where Marita Cheng high-fives a robot arm and says, “The world is a beautiful piece of engineering”. The mechatronics graduate designed the robot arm herself to help people with disabilities restricting their movement complete tasks by themselves. Or maybe you remember her as the 2012 Young Australian of the Year who founded Robogals while at university to encourage more girls and women to see the potential in studying subjects like engineering and science. For someone still in her 20s, she has already packed a lot into her life, but she’s not taking her foot off the pedal yet. Cheng has started two companies, 2Mar Robotics and Aipoly, in recent years and says they’re both doing really exciting stuff. Marita Cheng and her Teleport device. 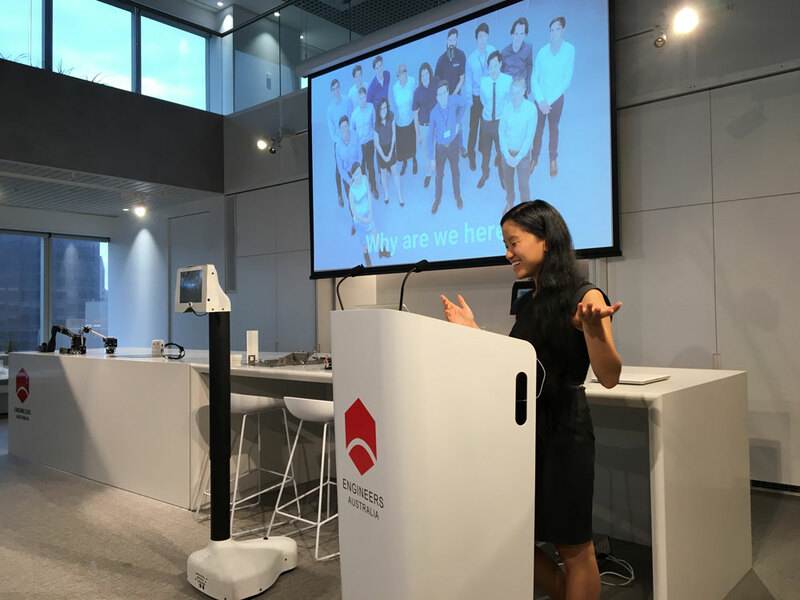 “With 2Mar, we’re making a robot called Teleport and it enables someone to be in Sydney but have a robot in Melbourne, and another robot in Brisbane,” she said. “So, for example, someone with a spinal cord injury could be bedridden and still go to school, or go to work, or have meetings all over the world. It could be used by kids who are in hospital with cancer and they could have these robots at school running around. The robot looks a little like a tablet computer on a pole, and Cheng said the advantage of a product like this over something like using Skype on a laptop is the user can control the robot themselves and doesn’t have to rely on someone else carrying the laptop around. Marita Cheng describes Dianne Boddy as her mentor. Boddy is a rare creature in that she is a self-taught engineer who was granted chartered engineer status without ever completing a degree. After getting a job as a tracer in an engineering firm, she became interested in engineering and setting about learning as much as she could over the course of her 55-year-career, which involved more than 2000 designs and 40 international patents. “I learnt all the nuts and bolts of engineering design first, in an environment where I could react to it on an hourly or daily basis as I chose,” Boddy said. Boddy heard about Robogals and decided that, with her own career in robotics, she should meet up with Cheng and see if she could help out. “She was working on her first robot at that stage, so I agreed to help them with the mechanical side of it,” Boddy said. Boddy described Cheng as a charming, engaging person with an enthusiasm that is just boundless. “I think she’s going to mature into quite something,” Boddy said. The second company Marita Cheng is working on, Aipoly, is building a smartphone app that enables blind people to identify objects. “All you have to do is hold your phone, pass it over the various objects, and in real-time it recognises chairs, the floor, tables, different colours,” Cheng said. She said the unique thing about the app is that all the computation happens on the phone, and so it’s able to detect objects in real-time rather than having someone take a photo and then send that object over the internet to a cloud server. “Recognising something in real-time means that the person who is blind is able to identify more objects in a shorter space of time and they can get on with their life a lot quicker,” she said. The Aipoly app can recognise 1000 objects and colours at a rate of three per second. The team is working to expand its vocabulary and allow it to describe more complex scenes. The Aipoly app and the company developing it are less than a year old. It grew out of the Global Solutions Program at Singularity University in California, where entrepreneurs and technologists are brought together to work on team-based technology solutions for widespread global challenges. Cheng was teamed with Italian Alberto Rizzoli and Swede Simon Edwardsson. “We discussed what are the technologies that you think are the coolest and the hottest ones,” Rizzoli said. Cheng said she met a woman at Google with a PhD in computer vision and asked her if she knew of any problems in the space. “One of the things she mentioned is that she had a blind friend who wasn’t able to recognise objects in surroundings that were unfamiliar to them,” said Cheng. They called organisations for the blind to find out what they wanted, and four days later they had a first version of the product to show a range of people to get feedback. “The first version was what we call a minimum viable product, or MVP, in tech prototyping, which means that you use the least amount of resources to make it look as realistic as possible to what you actually want to do,” said Rizzoli. Working through issues with potential users led to a second product, which they demonstrated at Singularity University where it won Class Favourite and Judges Favourite. Buoyed by this success, the trio decided to pursue the project. 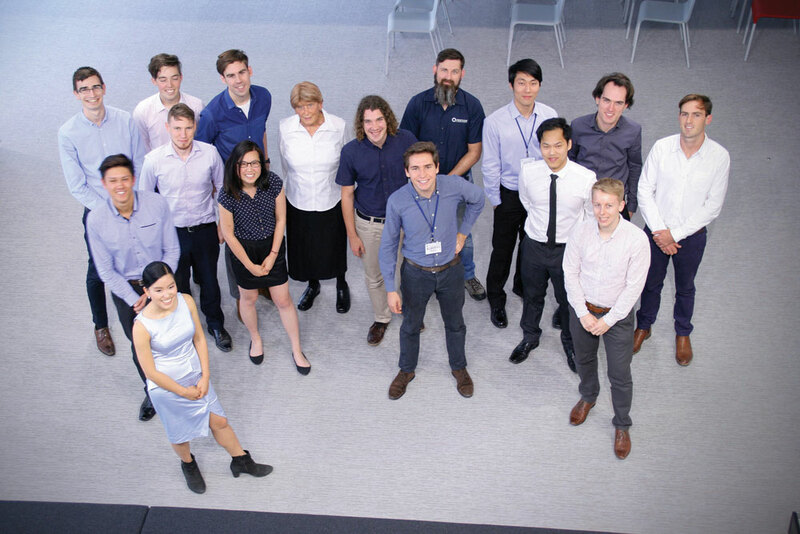 The Aipoly team has been working at the Engineers Australia office in Melbourne to improve the app’s artificial intelligence and the number of objects it can identify. When they first started it could tell about 200 objects apart. “It currently can recognise about 1000 objects and we’re sorting through the next version of the algorithm, which is able to recognise 5000 objects,” Cheng said. Marita Cheng and the Aipoly team in Melbourne. While both her companies are involved in helping people with disabilities, Cheng said she has no personal motivation to work in that area. “Helping people with disabilities in their everyday lives is part of our vision, because if you can be useful to someone who has no use of their legs, then you can be useful to someone who has use of their legs and arms,” she said. Cheng was born in Cairns, Queensland, and grew up in housing commission with her brother and single mother, who worked as a hotel room cleaner. Armed with a high QCE mark and a love of maths and science, she decided to study mechatronics and computer science at the University of Melbourne. Her first shock was the low number of women studying engineering. At school, she was conscious that few girls shared her interest in maths, science and solving problems in general, but expected there would be more girls like herself from around Australia once she reached university. The idea for Robogals was born, and in just her second year at university it became a reality as Cheng and other students started running robotics workshops in schools to encourage more girls interested in engineering and technology careers. Since then, the organisation has conducted thousands of workshops in schools and established chapters around the world. She still talks to students at school when she can. Marita Cheng and her Teleport device at the Engineers Australia office in Melbourne. “I tell them about cool technology projects around the world and I show them projects that I’ve been working on, so I tell them about the robot arm and I tell them about Teleport,” she said. She said girls are drawn to helping people and that is what they focus on in the workshops. “That’s something we really try to emphasise, real-world problems, problems that help people,” Cheng said. In fact, scale was one of her motivations for studying engineering in the first place. “I liked the idea of helping millions of people using great technologies, rather than just helping one person at a time. We can scale the impact of how you help people with engineering,” she said.